We carry a large selection of unique beach wedding apparel and accessories for men, women, and children. Not finding it off the rack? We also offer "Build a Shirt" custom manufacturing from a large selection of styles, colors, and fabrics. You can be sure to get just what you are looking for. Wedding Tropics designs and manufactures all of it's unique designs in Havana, Guayabera, and casual linen shirts, suits, and pants styles. Now customize your shirts and pants to match colors and build the exact styles you need right online! We give you surety that each of your penny you execute with us come back to you in type of most ideal attire you ever have. We are an online store, the place you could figure each coat that you require been seeing worn by particular VIPs and characters. We give motivations of such outfits. It is our GUARANTEE that when you spruce up with our clothing, individuals will continue cherishing and appreciating you. Handmade custom veils, ring bearer pillows, garters, hand bags, and flowergirl baskets that can be shipped anywhere in the world! Custom wedding gowns, bridesmaid gowns, and alterations available for area brides. Anything that can be sewn I can do! 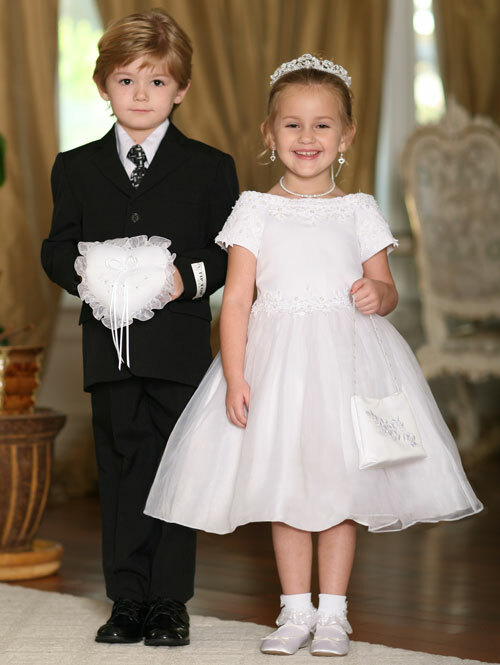 From tiny babies to 'lil gents and ladies, we've got flowergirl dresses and suits/tuxedos for your special day. Also pageant dresses, party dresses, church ceremony clothing, shoes, and accessories. Established Formal Wear Boutique specializing in Brides, Bridesmaids, Mother of hte Bride, Flower Girls Dresses and other special occassion dresses, like Prom and Homecoming. In addition, in we offer a full line of Tuxedos both, Mens and Childrens ready for rent everyday! PROM IS HERE!